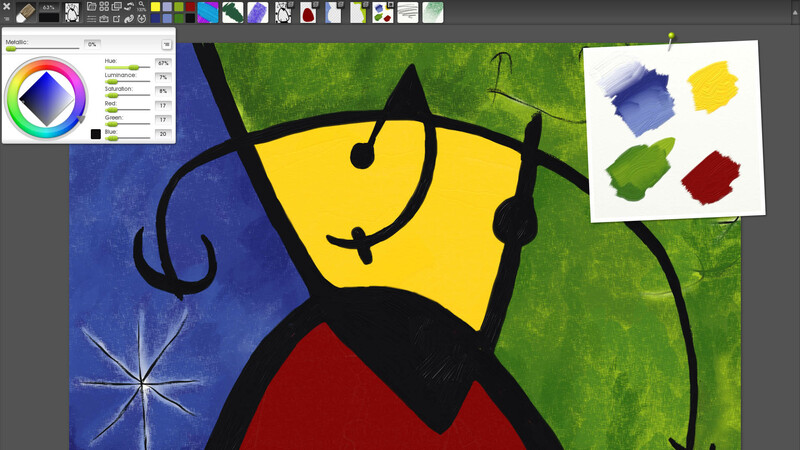 Are you ready to become a digital Picasso? A pixel Rembrandt? A binary van Gogh? Well, ArtRage 4 is here to try and help you on your way. ArtRage is an digital painting software package that is geared toward bringing the feel of traditional painting and drawing to your screen. When you pair this up with a drawing tablet, it does have a very natural feel of drawing or painting with a pretty narrow learning curve to get up and running. This moderately priced program features a full palette of brush styles like the watercolor brush, oil brush, palette knife, airbrush, ink pen, pencil, paint roller, felt pen, gloop pen, sticker spray, pastel/chalks, paint tube, glitter tube and of course, an eraser and, the new to version 4, cloner tool. Most of the brushes are pretty self explanatory like the watercolor, oil brushes, airbrush, pencil, pastel and so on. They all look pretty realistic but mix better than the real world versions do. One of the more unique characteristics of ArtRage is that the paint builds up. When you put some oil paint down with the oil brush, it behaves like there is residual paint left on the canvas. This means when you use things like the palette brush or even when you pick another color with the oil brush and go over the top, you get a smearing effect as the paints mix on the canvas. An effect that you don’t get in a lot of other programs which really adds to the realistic painting feel to it. One of my favorite features of ArtRage is the ability to pin reference photos to the canvas that you can have always in view while you work. A lot of other programs you need to do little tricks to get something like that to work or a second screen to display them. 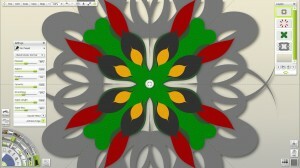 A more common functionality that it has is the ability to also display a tracing image below the canvas to work over. I use this less often, but it’s nice when you need it. Because this is a digital work, it does support some pretty standard features on that digital artists should be pretty familiar with. You have the ability to add new layers to separate your pieces of your masterpiece. The layers, beyond separating the elements, also have blending modes to control their affect on lower layers and opacity controls. If you mess up, it’s pretty easy to use the capable selection and transform tools to finely tune your work. 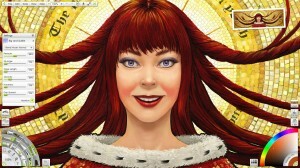 While ArtRage 4 initially looks very similar to it’s predecessor, it does feature some upgrades. One of the issues I had with the previous version was it’s ability to handle large files which you need if you want to make something intended to be printed out for sizes or around 20 inches or more. Version 4 still does seem to have more issues with those larger files than some other programs, but it does seem to have improved. A new mode called Workbench mode has also been added giving you a full screen view with a black background and all the palettes get tucked away into buttons on a button bar. I actually prefer this cleaner, more professional looking view, but I was a bit disappointed that I couldn’t find a way to make it the default. There is also a new design mode called Symmetrical Mode. 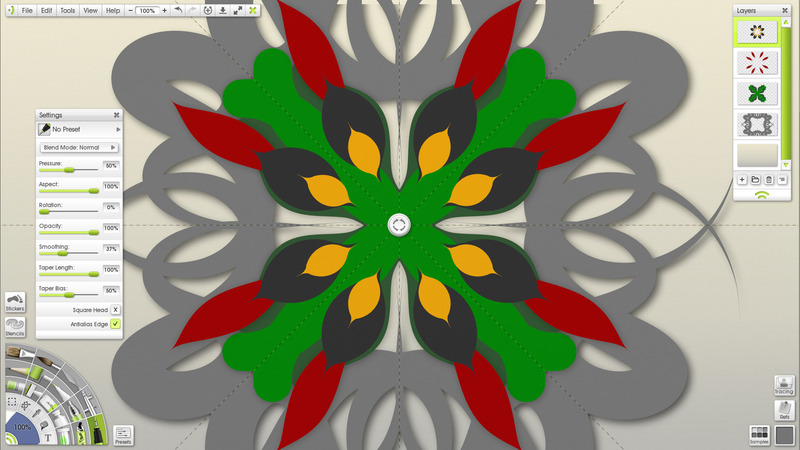 Symmetrical mode splits your canvas up into a series of evenly divided segments. Drawing on one of the segments makes mirrored marks on the other segments. It’s a lot like working on a kaleidoscope or drawing paper snow flakes. While it was kinda cool to play around with for a bit and my kids thought it was awesome, I was having trouble figuring out a really practical use for it. Best I could do was splitting it into 2 to create a perfectly matched halves by using only 2 segments. But still, the number of times I need that functionality is pretty slim. To be honest, there are a lot more features that I could mention but I only wanted to point out the highlights and the features I find most appealing and useful. Coming in at under $50, this painting package is very reasonably priced and has an easy to use interface that isn’t nearly as intimidating as a lot of drawing programs have a reputation for. While it does have it’s shortcomings, ArtRage is certainly something worth consideration especially if you are just getting started with digital painting. Pick it up and give it a try. Let’s see if you are the next Salvadore Dali.